Eric Idle (left) and John Cleese have been delivering laughs together since the 1960s. At 77, John Cleese finds that he laughs more now than he ever did back when he co-founded the pioneering Monty Python comedy troupe or earned an Oscar nomination for writing the modern classic A Fish Called Wanda. And credit for that, he says, goes to letting go of the idea that life makes any sense whatsoever. "When you're young, you think there's some hope for the world, that maybe one time in the future it will start being run in a rational way by sensible people who are trying their best for the population," Cleese says, calling in from his London home. "I've certainly given up on that idea, and I think it frees you to see exactly what kind of a madhouse it all is." Longtime fans might be surprised to learn this is a relatively recent realization for a guy who's always worked in dark humor alongside the surreal — from dead parrots to silly walks, from the flesh wounds of the Black Knight in Monty Python and the Holy Grail to his acerbic innkeeper in Fawlty Towers. 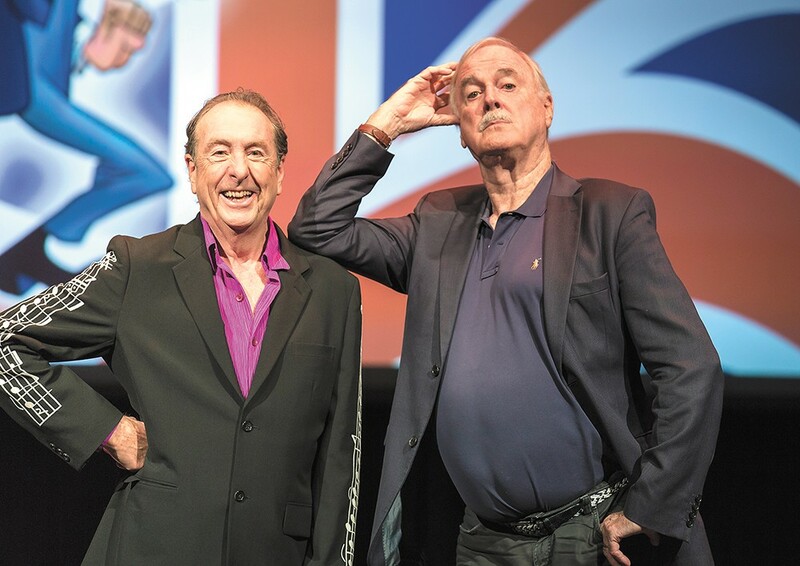 That freeing of the mind and recognition of life's folly has given Cleese's recent years a jolt of creativity, one that's encompassed a 2014 reunion of Monty Python for 10 live stage shows in London (the first sold out in 43 seconds), the publication of his autobiography So, Anyway... and now a two-man tour with fellow Python Eric Idle. The idea came together spontaneously, when Cleese was doing publicity for his book. He called Idle when he was in Southern California and asked if he might join Cleese at a bookstore for an impromptu "interview," Cleese says, "and the lovely thing was, it was almost a riot. The audience absolutely loved it." The success of their conversation reminded Cleese of the first time they worked together and pitched a Monty Python TV show to the BBC. "A real element of spontaneity can take you places that you can't get if you plan everything," Cleese says. "When the Monty Pythons went in ... and the guy in charge of the department said, 'What do you have in mind?' we couldn't tell him! We didn't know. We hadn't really discussed it! And as a result, we didn't have any preconceptions, and we came up with something that almost everybody agrees is very original." Indeed, the Pythons are revered decades later, something Cleese calls "incomprehensible" except for the fact that when he met the legendary vaudeville comic George Burns, he felt the way many feel about Python. Of course, he's done plenty in the years after Python, doing roles in a couple of James Bond and Harry Potter flicks in addition to his own creations like A Fish Called Wanda. His show with Idle, though, will lean on Monty Python. The two will share old clips and tell stories from the old days in addition to offering new original skits and stand-up material. Cleese says they try to keep it a little unpredictable, and even he has learned things about Monty Python thanks to listening to Idle on stage, like when Idle mentioned that if they had starting filming Monty Python's Flying Circus one month earlier, it would have been made in black-and-white, probably dooming it to failure. "I didn't know that," Cleese says, "and he told me in the middle of a show." Don't expect a lot of wistful nostalgia from these two. Their primary objective is to make the audience laugh, and few have proved better at doing that consistently over so many years than Cleese. "Laughter is so important, more and more important, particularly in today's world," Cleese says, recalling the adage that the "shortest distance between two people is a laugh."